Sakarya (Turkish: Sakarya ili) is a province in Turkey, located on the coast of Black Sea. The Sakarya River creates a webbing of estuaries in the province. Sakarya is located in the Marmara Region. Its adjacent provinces are Kocaeli to the west, Bilecik to the south, Bolu to the southeast, and Düzce to the east. The capital of Sakarya is Adapazarı. The climate is oceanic due to its close proximity to the Black Sea. Sakarya is situated on the Ankara-Istanbul Highway. It is connected through both road and rail. Sakarya is serviced by Istanbul's Sabiha Gökçen International Airport. The current mayor of Sakarya is Zeki Tocoglu (AKP). The city of Sakarya, one of the most important cities in Turkey for its rapid growth and development, is also attention worthy for its natural beauties and cultural richness. It is one of the paradise-like spots of the country with its sea, beaches, lakes, rivers, highlands, thermal springs along with traditional Ottoman lifestyle districts such as Taraklı and Geyve, and historical relics inherited from the Byzantine and Ottoman eras that are worth witnessing. The Turks conquered the city of Sakarya in the 13th century. There was intensive immigration from Caucasia and the Balkans in the 18th and 19th centuries. The last massive immigration was in 1989. Thanks to the developing industry and being at a transportation crossroads, the city still receives domestic migration today. Sakarya is notable in the Marmara Region. 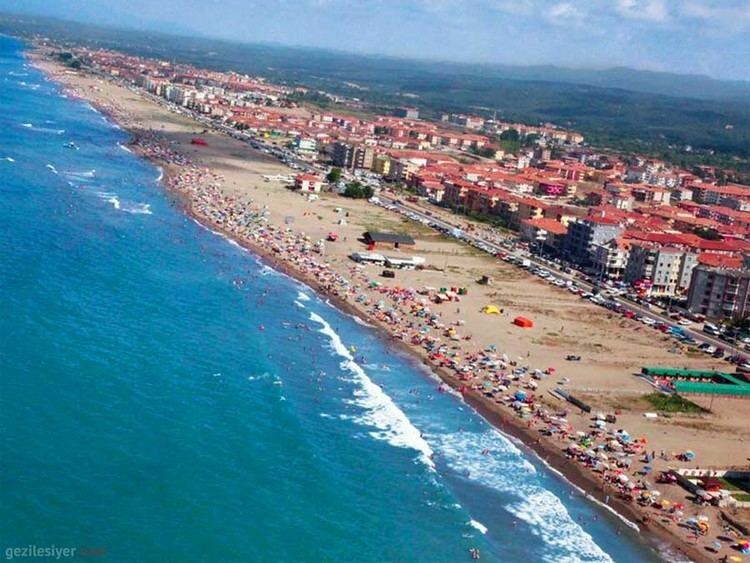 The city of Sakarya is surrounded with the city of Düzce in the East, Bolu in the South East, Bilecik in the South, Kocaeli in the West and the Black Sea in the North. 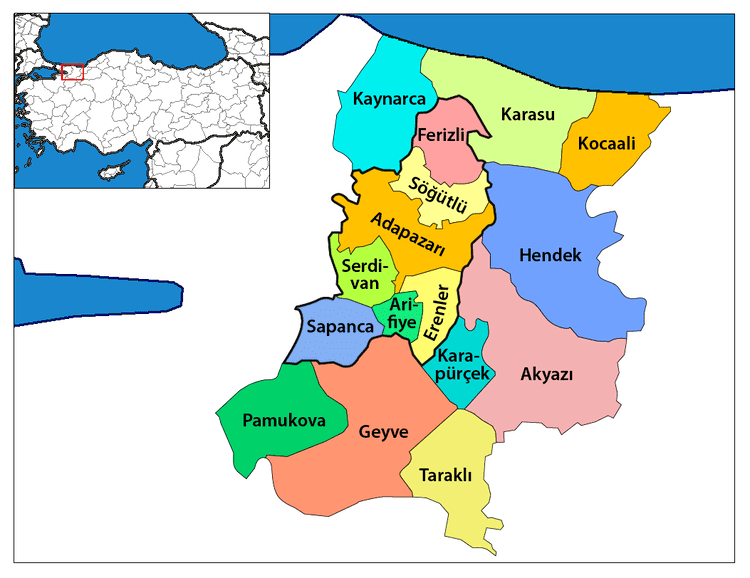 The city of Sakarya has 16 districts which are; Adapazarı, Akyazı, Arifiye, Erenler, Ferizli, Geyve, Hendek, Karapürçek, Karasu, Kaynarca, Kocaali, Pamukova, Sapanca, Serdivan, Söğütlü and Taraklı. Sakarya is located at the intersection of all the important roads and railways. The D-100 (E-5) highway which has an important role on domestic and international transportation and passes through the city East-ward all along together with TEM highway and the D-25 highway in the direction of Bilecik are the main transportation axis of the city. Kınalı-İstanbul-Sakarya-Ankara highway which originates from Edirne has an important role in an international scale. In Kınalı, one branch of the highway is connected to Greece while the other branch is connected to Bulgaria. These are the distances to some of the main cities from Sakarya: 797 km to Adana, 583 km to Antalya, 102 km to Bilecik, 158 km to Bursa, 188 km to Eskişehir, 148 km to İstanbul, 933 km to Trabzon, 306 km to Ankara, 114 km to Bolu, 486 km to İzmir, 79 km to Düzce, 708 km to Muğla, 179 km to Zonguldak and 37 km to Kocaeli. There are 7 railway stations throughout a 65 km railway inside the city limits. The railway which connects Istanbul to Ankara and other Anatolian cities passes through Sakarya. The distance of Sakarya to Istanbul by railway is 141 km and 436 km to Ankara. If you prefer to travel to Adapazarı by air, the nearest airport is the Sabiha Gökçen Airport in Kurtköy – Istanbul and Istanbul Atatürk Airport in Yeşilköy. Adapazarı was a village named “Ada” in 1573, a sub-district in 1646, a village inside Akyazı in 1658, administrative district of a qadi in 1692, and again a sub-district in 1742. The residency area had the status of a district for 117 years between 1837 – 1954 during the Ottoman and Republican eras. Adapazarı, being a district of Kocaeli for many years, separated from Kocaeli and took the name “Sakarya” in June 22, 1954 by the law number 6419. After Adapazarı took the name Sakarya as being the center of the districts Akyazı, Geyve, Hendek and Karasu, in December 1, 1954 the first governor Nazım Üner began active duty with ceremonies. While Adapazarı was experiencing a rapid growth and great development in the center of Akova, the city had to face a great destruction during the great Marmara earthquake in August 17, 1999. 3891 residents lost their lives while 26551 buildings collapsed and almost 100000 people were left homeless. The city was trying to be reborn from its ashes with the help of state/people collaboration when Adapazarı Municipality which was founded in 1868 gained the status of Metropolitan Municipality on March 6, 2000 by publication of the council of the ministers’ enactment number 593 on the Official Journal. Already present Adapazarı Mayor Aziz Duran was brought to Adapazarı Metropolitan Mayor Office. With the legal amendments made in 2004 and 2008 the range and service area of the Metropolitan Municipality were extended. 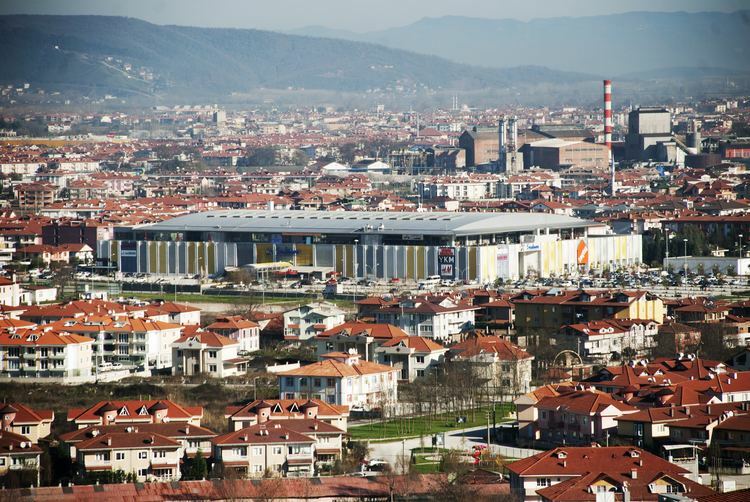 In 2008 legislation was passed to change the name of Adapazarı Metropolitan Municipality to Sakarya Metropolitan Municipality to prevent confusion. Sakarya Metropolitan Municipality is in service with its 16 districts and more than 870000 people.